Presentation of the information via the Internet is not intended to create, and receipt does not constitute, an accountant-client relationship. Internet subscribers, users and online readers are advised not to act upon this information without seeking the service of a professional accountant. Any U.S. federal tax advice contained in this article is not intended to be used for the purpose of avoiding penalties under U.S. federal tax law. Jani-King International, Inc. and its affiliates do not provide tax, legal, or accounting advice. This material has been prepared by the author for informational purposes only, and is not intended to provide tax, legal, or accounting advice, nor should the reader rely on it for such advice. You should consult your own tax professional, lawyer, or accountant for guidance. Presentation of the information in this article does not create, nor is it intended to create, an attorney-client or accountant client relationship between the author and the reader. The Tax Cuts and Jobs Act (TCJA) is the most significant overhaul of the US tax code in more than 30 years, effectively lowering business and individual tax rates and modernizing the US international tax rules. There are a variety of provision in the TCJA that are expected to be particularly impactful to Jani-King business and Jani-King Franchise Owners. Understanding these provisions early will help effectively plan for the tax consequences in 2018 and beyond. This article highlights the most significant changes impacting the businesses and the franchise industry. The article is meant only as a summary of the author’s general interpretation of certain changes under the TCJA. It is highly recommended that you consult with your CPA or tax advisor regarding the new Act and its specific impact on your business and personal tax position. Although the Corporate tax rate was reduced to a flat 21% in the TCJA, the more impactful change comes to Pass-through entities, under which most Jani-King Franchises are organized. A Pass-through entity is a Partnership, S Corporation, or Sole Proprietorship. A partnership files Form 1065, an S Corporation files Form 1120S, and a Sole Proprietor files Schedule C as part of their Form 1040, personal tax return. On the Gulf Coast, the FDD required franchise owners to organize as a Corporation or LLC, which means Franchise Owners had to choose to file one of the aforementioned tax filing types, since July 1, 2009, the majority of which choose Pass-through entities. Most franchise owners organize as an LLC in states where that entity selection is available due to the inexpensive nature of setting one up and the tax benefits of operation. They are not double taxed, like corporations, and depending on the filing type selected (1065 or 1120S) may allow owners to both be on payroll and take distributions, thereby maximizing the tax benefits of each. The TCJA implemented a deduction of 20% of domestic qualified business income or QBI, from a pass –through entity. This effectively reduced the top marginal rate to 29.6%. There are some substantial caveats, however. If a pass-through is identified as a Specified Service Business this deduction may be limited or eliminated completely. A Specified Service Business is defined as “any trade of business involving the performance of services in the fields of health, law, accounting, actuarial science, performing arts, consulting, athletics, financial services, brokerage services, or any trade or business where the principal asset of such trade or business is the reputation or skill of 1 or more of its employees.” Architects and engineers were specifically removed from this list. However, it’s believed the Jani-King franchise will be defined as a Specified Service Business. It can be expected there will be more discussion on which businesses qualify or not in the coming months, but the conservative, and likely, outcome is that the Jani-King unit franchise will qualify. There is an argument that because of the franchise model, there may be cause to not classify as a Specified Service Business, as the principal asset can be argued is the brand itself and not the individuals making up the brand. But the true intention of the law seems to point to an inclusion of service companies, for which a Jani-King franchise would qualify. If a Franchise is a pass-through and a Specified Service Business, limitations on the 20% deduction begin after QBI reaches $315,000 for Married Filing Joint taxpayers and $157,500 for Single Filers. 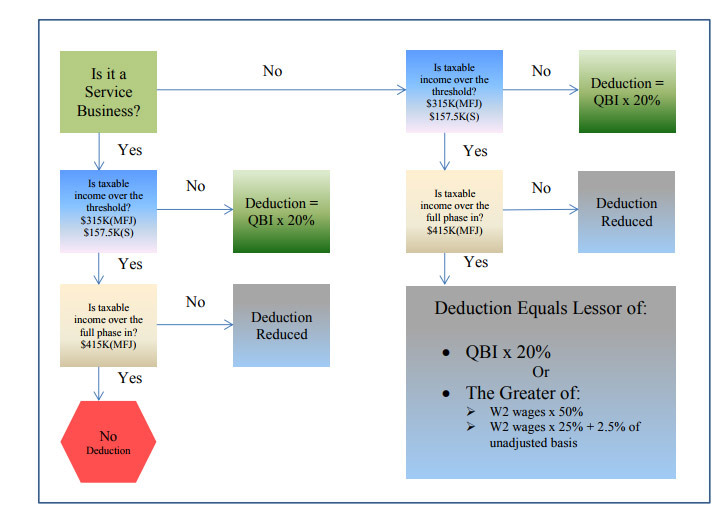 If QBI is over $315,000, the deduction is limited to either 50% of W-2 wages or 25% of the W-2 wages plus 2/5% of unadjusted basis of assets, whichever is greater. Following is a chart to help illustrate these guidelines. The following is an example of a Franchise that is a Pass-through and Service Business, below the phase-out range. 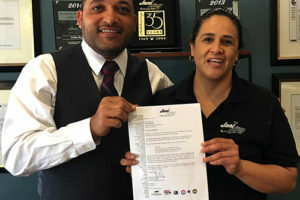 Joe and Sue, Jani-King Franchise owners who each own 50% of their Franchise, J and S, LLC, have $100,000 of pass-through net business income in 2018. Joe has another $90,000 of other income and Joe and Sue expect to take the standard deduction ($24,000) in 2018. Based on these facts, Joe and Sue would start their calculations with $100,000 of pass-through income. They would add to that the $90,000 of other income to come to and Adjusted Gross Income of $190,000. After they subtract the $24,000 standard deduction, their taxable income would be $166,000. 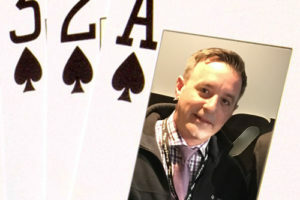 Joe and Sue are eligible for a QBI deduction of $20,000 calculated as the lessor of a) 20% of net business income of $100,000, which is $20,000 or b) 20% of taxable income of $166,000 which is $33,200. Say for example that Joe and Sue made much more with their Franchise this year and exceed the phase out range. If Joe and Sue make $550,000 of pass-through net business income in 2018 and take the standard deduction, their Taxable Income would be $526,000, which is above the phase out range for married filing joint(MFJ) taxpayers. Because the taxable income is over the full phase out range, there is no QBI deduction available for Joe and Sue. The debate over the classification as a Service Business becomes very important as the following illustrates. In the same set of variables as above, if Joe and Sue were not classified as a Specified Service Business, the QBI deduction in our first example would remain at 20%. However, in the second example, let’s assume Joe and Sue had $250,000 of W2 wages and $100,000 of assets. They would be allowed a QBI deduction of $105,200. This is determined by first determining the greater of a) 50% of W2 wages ($125,000) and b) 25% of W2 wages and 2.5% of assets ($65,000). Then take the lessor of the $125,000 calculated compared to the 20% of Business income of $550,000 ($110,000) and 20% of taxable income $526,000 ($105,200). The TCJA has also made 2018 a great year to purchase commercial cleaning equipment for Jani-King franchises. Bonus depreciation is effective from September 27, 2017 through 2022. Bonus depreciation allows you to deduct the full cost of equipment in the first year placed in service, rather than depreciating the asset over its useful life and only getting a deduction for part of the cost each year. Bonus depreciation has also been expanded to include used property that is new, placed in service this year. Section 179 depreciation was also expanded considerably, increasing the limit to $1,000,000 and raising the phase out to $2,500,000 of property in service during the tax year. Section 179 also applies to used property. The SUV limit remains at $25,000, however, the TCJA extended the additional $8,000 bonus/AFYD luxury car limit provisions assuming bonus depreciation applies. If entertainment is used as a way to increase business and network with potential customers, those deductions will no long be allowed. Prior law allowed a deduction of up to 50% for meals and entertainment expenses to be deducted. Current law disallows them completely; irrelevant if those expenses were directly related to or associated with the trade or business. A deduction for advertising is still allowed, and many experts expect that a shift will occur from M&E into other areas such as advertising at company events or school functions rather than entertaining decision makers, as a way to woo new business in a form that is deductible. For larger franchise owners, or for those that want to go above the requirements of the law and participate in Family and Medical leave program, there is a new credit to help employers. The TCJA is allowing a credit of 12.5% of wages paid, plus an additional .25% for each point in excess of 50% of the employee’s salary for which the employer provides coverage. The maximum credit is 25%. Although the business changes were significant, for pass-through entities, the net result of those changes end up on the individual tax return of the Franchise. And the individual tax return saw some major revisions with TCJA as well. And because taxes are remitted with the individual return for a pass-through entity, these changes, in addition to the business changes, combine to create some major adjustments in 2018. Below are some of the larger, more significant individual changes noted. 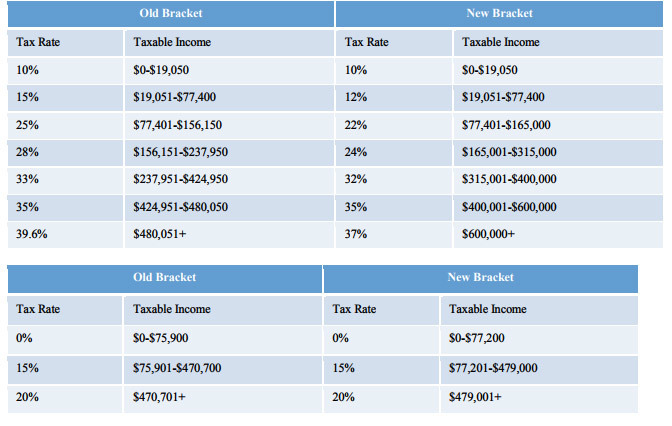 Although all 7 tax income tax brackets were retained, the rates decreased overall for those brackets and the top bracket was lowered to 37%. In additional to Income tax rates, capital gains rates were also reduced. 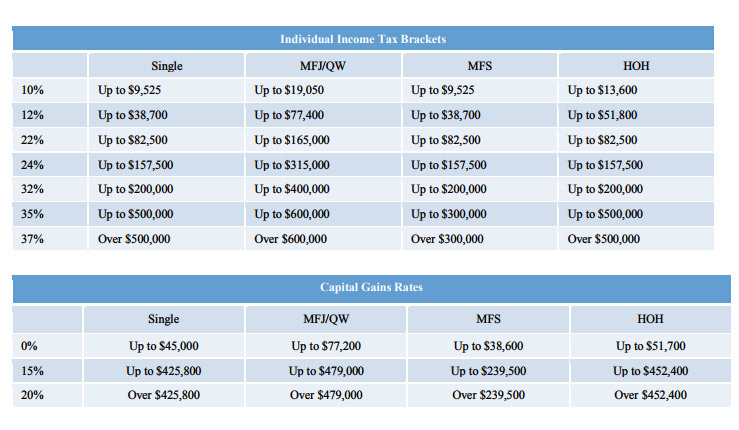 Following are several charts that illustrate the change in Individual Income Tax Brackets and the Capital Gains rates for 2018. Please see the included comparison of the 2017 rates to the 2018 rates for a sample Married Filing Joint taxpayer for both Income Tax and Capital Gains. In an effort to simplify tax filing and reduce the number of exemptions, the TCJA has eliminated personal exemptions completely, which was previously $4,050/individual. 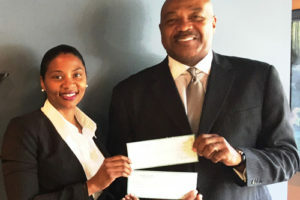 However, this exemption was already subject to a phase out provision beginning with an Adjusted Gross Income (AGI) of $313,800 for Married Filing Joint taxpayers and was completely phased out at $436,300. Although the personal exemption was removed, the standard deduction has almost doubled. This will reduce the likelihood of Itemizing deductions, because the taxpayer is allowed to choose the higher of the standard deduction or itemized deductions. Now that the Married Filing Joint standard deduction is $24,000, itemized deductions of charitable donations, mortgage interest, and state taxes would need to exceed $24,000 to have a tax effect. This may require you to reconsider some of the expenses you normally incur while expecting a tax deduction. For example, experts theorize that charitable donations may be changed to an alternating annual cycle for many taxpayers, in order to maximize the tax effect of the donation in any given year. Another expanded benefit of the TCJA is the increase of the child tax credit from $1,000 to $2,000. The child tax credit is a nonrefundable credit that reduces the tax liability on a dollar-for-dollar basis, making it a very attractive and beneficial credit. It is intended to provide additional relief to taxpayers with qualifying dependents. In addition to the increase, the TCJA has expanded the credit to include an additional $500 nonrefundable credit for non-child dependents, which could apply to elderly parents or disabled adult children, for example. The phase out for this credit has also increased from $110,000 in 2017 to $400,000 in 2018 (for Married Filing Joint taxpayers). While on the topic of children, TCJA has also expanded the qualified expenses for section 529 plans. Section 529 plans are education savings plans operated by the state or an educational institution designed to help families set aside funds for college. It is a tax-advantages savings plan that is exempt from federal taxes and often has very favorable state tax effects also. The TCJA has expanded the use of 529 plans to any qualified expense for elementary and high school, in addition to college, meaning you can use the Section 529 plan to save and pay for private education. There are many more provision enacted by TCJA that could possibly impact Jani-King franchisee returns. The State and Local Tax (SALT) deduction has been limited to $10,000. Mortgage interest deductions have been limited to only the interest paid on $750,000 of indebtedness and is repealed for home equity lines of credit. The charitable contribution limit for cash donations increased from 50% to 60%. Personal Casualty Losses were repealed, except in declared disaster areas. The medical expenses threshold was set to 7.5% of AGI. The job expenses and miscellaneous deductions 2% floor was repealed. Moving expense deductions were repealed. Alimony deductions were repealed and also the corresponding inclusion in income by the recipient was repeal for tax years beginning in 2019. All existing agreements entered into before 2019 will be grandfathered in under the old rules. Wagering losses and expenses are limited to wagering winnings. Finally, the AMT exemption amount has increased from $84,500 to $109,400 for Married Filing Joint, for example, and the Phase out has increase to $1,000,000 (MFJ). The Tax Cuts and Jobs Act has indeed overhauled the existing tax code. Many of the changes may result in lower tax liabilities for Jani-King franchise owners, but understanding the changes and planning now for 2018 will help maximize the benefits of those changes. Meet with a CPA or tax advisor early to strategize on the direction franchise owners may take this year. Because of the sheer number of changes, it is important to sit down with an adviser and consider the full effect a change may have starting with a Jani-King franchise business income and flowing through to an individual return and your ultimate tax liability. Overall, the TCJA was written with the intention to Create Jobs and Cut Taxes, as its name implies and to ensure that American businesses are competitive with the international markets. Learn the law early, maximizing your benefit and making 2018 an exceptionally great year for franchise owners and their business.